​Our friend and follower Diego Gala (who is from Escalona del Prado - Segovia) is owner of one of the best dairy farms in Spain (it is planned to publish a post about that in December) sent us some pictures and comments about his new Claydon Hybrid Stone-Pro seed drill to drill​ing​ direct into stubble and also into cultivated soils. He can brag to be the first customer of Claydon in Spain (Claydon is a British company that manufactures machinery to tillage and sow). As he commented, he knew this seed drill on the Internet and in the last edition of Fima 2014,​ ​he could see it and he decided to buy because it is exactly the seed drill needed by him to perform his direct sowing tasks required in his 200ha what are dedicated to produce feed for his cows, despite the fact that this see drill is not cheap. This seed drill is a mounted Claydon Hybrid Stone-pro of 4m working width. 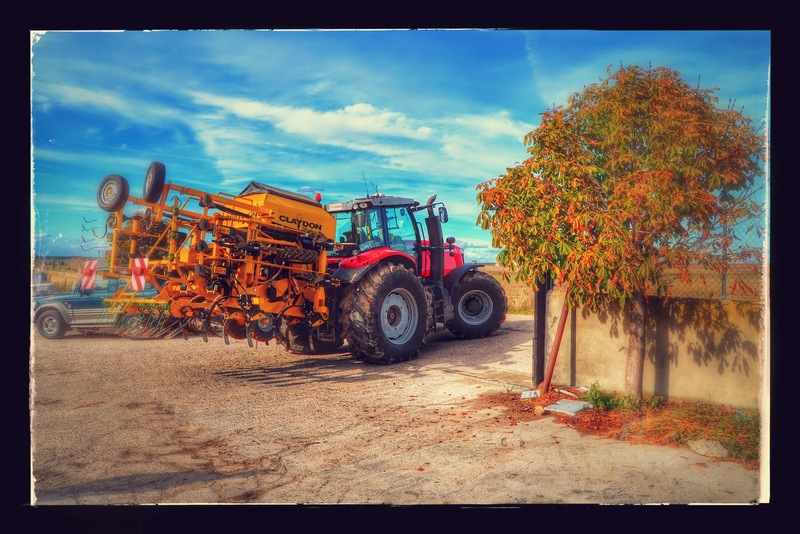 It has an Accord metering system and it uses 13 seeding tines​ (furrow of 18cm where seed is deposited)​ and ​13 tines to tillage (hydraulic stone release); this machinery allows him to carry out tillage and sowing jobs​ a​t the same time. The weight, with the seed hopper full, is about 3,500kg so his new Massey Ferguson 7626 Dyna-6 can work very fine with this seed drill. It has hydraulic marker arms but we think they aren't necessary because the tractor uses a very good ​guidance steering system. In our opinion, the work done is really not a direct seeding because this seed drill has tines to tillage and other seeding tines to sow... direct sowing has always been known for not moving soil and just makes a small furrow where the seed is deposited, so we think this seed drill is to minim​um​ tillage tasks... what do you think about that? This machinery is ideal for our friend Diego because he throws purines on his fields and the weight of the tank together with the passage of sheep produces much soil compaction so he needs to complete some superficial tillage tasks. We have pictures about other Spanish Claydon's customers (Paco Bernabé, Eutiquiano Migueláñez y Florentino Arribas) who have an agricultural society in Villovela de Pirón - Segovia where they till about 1,000ha with their ​new ​Claydon Hybrid Stone-Pro seed drill of 4.8 working width and their Fendt 718 Vario. Thank you very much for your pictures and comments. Muy buen reportaje!!!! No conocía estas máquinas, con esa presiembra te ahorras una pasada de cultichisel!. Tienes toda la razón, pero la máquina está orientada a siembra directa o tal vez minimo laboreo... no es una presiembra como la que podemos llevar nosotros en una sembradora convencional, simplemente es un nuevo sistema que mezcla siembra y presiembra para trabajar en terrenos duros que no han tenido una labor previa. Desde los Montes Torozos desear que vuestro amigo disfrute tanto tractor como máquina con salud. Espero nos podáis poner la evolución de la cosecha y los rendimientos finales. Le pediremos a nuestro amigo Diego Gala que nos haga un seguimiento de sus cultivos para ver como evoluocionan... os lo iremos indicando.